Peshawar: The Pakistani military said Monday that seven soldiers had been beheaded by militants who infiltrated from Afghanistan, lashing out at Kabul over cross-border attacks. The military had already reported that six soldiers were killed in gunbattles with militants Sunday who crossed from Afghanistan into the northwestern district of Upper Dir, a key border transit route that neighbours the Swat valley where Pakistan defeated a local Taliban insurgency in 2009. Intelligence officials blamed the attack on loyalists of Pakistani cleric Maulvi Fazlullah, who fled to Afghanistan after losing control of Swat to the army. But on Monday, a military official said 11 soldiers had also gone missing, “out of whom seven soldiers have been reportedly killed and then beheaded”. The bodies have not been found, but intelligence intercepts indicated that they had been killed, said the senior military official. 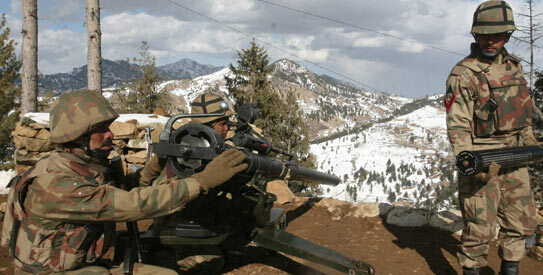 The army said more than 100 militants “from a safe haven across the border” attacked troops on patrol. It claimed to have killed 14 militants. Two rockets and sniper fire were also fired into Lower Dir on Monday, said the official. Earlier, some reports had put the number of security personnel killed at 10, whereas another report said six were killed with 10 reported to be missing. Updated reports put the total number of soldiers killed at 13, including the seven now reported to be beheaded in captivity. Pakistan lodged a protest with Nato and Afghan forces Monday, accusing them of failing to act against militant safe havens in Afghanistan, a military official said. The army “has strongly protested with their counterparts across the border for not taking action against miscreants present in safe haven in Afghanistan,” said the military official. The foreign ministry said the deputy head of Afghan mission was called to the Foreign Office and a strong protest was lodged on “the intrusion of militants from the Afghan side into Pakistani territory.” The Afghan diplomat was informed that “the government of Afghanistan should take appropriate measures to prevent recurrence of similar incidents in future,” it said. The Pakistani prime minister on Monday also condemned the attacks and said he would discuss the matter with President Hamid Karzai. “Pakistan has strongly protested with Afghanistan on the cross-border attacks and I will also take up this issue with Karzai,” Raja Pervez Ashraf told reporters in Karachi. His office, however, did not elaborate on when such a conversation might take place. Fazlullah Wahidi, governor of Kumar province, said militants were based in Pakistan, not Afghanistan. “We don’t have any information about militants crossing the border from Afghanistan to attack troops in Pakistan,” he said. The Malakand faction of the Pakistan Taliban claimed responsibility of the incident, and has threatened more attacks. This entry was posted in News and tagged Afghan militants, Nato, Pak Army, Pakistan, Pakistan Army, Swat. Bookmark the permalink.